Not surprisingly, succulents for wedding favors, bouquets and boutonnieres are the latest buzz. Their beauty, resilience and ability to live for a long time without water make succulents the best choice for wedding crafts. 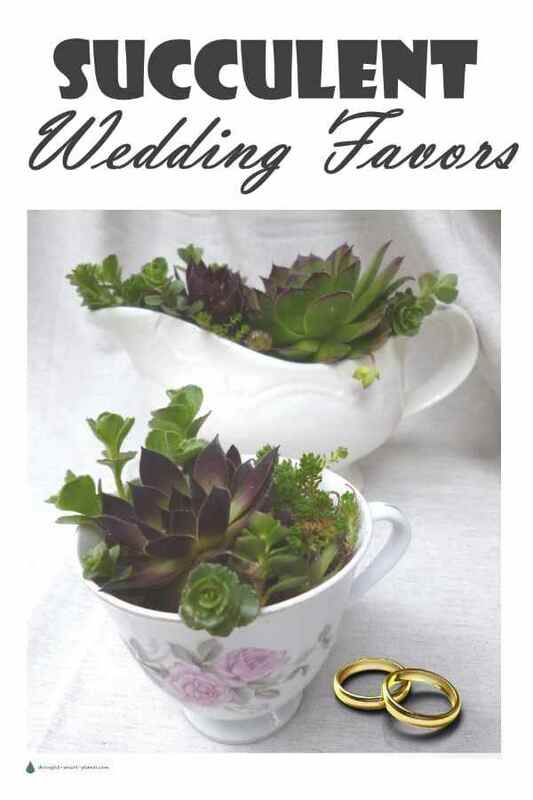 Succulent wedding favors are easy to make for the diy bride, and which wedding guest wouldn’t like to get a little succulent plant in a special pot as a memento? Small sized terra cotta pots or other little containers such as tiny tin buckets or baskets can be found in dollar stores and bargain shops, lowering the cost even more. Vintage tea cups or other thrift store finds are charming too. 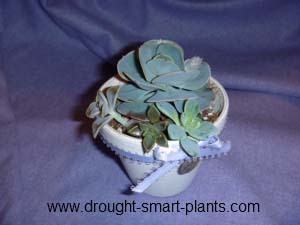 Succulents that have outgrown their space and need to be pruned supply the plants, and making up the favors ahead of time to root in the pot makes them economical and easy. This can take a few weeks, so make these up in the months ahead of the big day and take the pressure off. Paint small terra cotta pots in a base colour, and add a ribbon in your wedding colours. You can attach a charm or other trinket for decoration, and carefully fill the pot with dry potting soil. 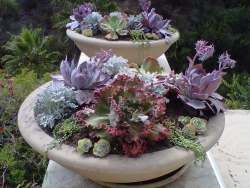 Use a fast draining succulent or cactus mix with additional pumice or turkey grit. Make sure the pots you use have drain holes. Cut off the tops of any overgrown succulent plants such as Echeveria or Sedum, take off the bottom few leaves to leave some of the stem bare, and stick this into the dry soil. Don’t water them until they resist being pulled out to show they’re rooted, and then carefully water with tepid water so as not to mark the ribbon or other decoration on the pot. These require very little care, except bright light and a warm room to happily root and adapt. Looking for a hardy succulent version? Don't miss the Sempervivum wedding favors examples here. Your guests will love these little succulent wedding favors as a memento of your happy day. Are you planning a Succulent Wedding? Using succulents as wedding flowers is all the rage - show off your pictures here!